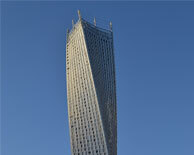 The Infinity Tower, being built to achieve a 330 meters height would be the tallest twisting tower in the world. The tower’s dynamic twisting shape challenges the conventional architecture and redefines the standards of luxury. Located at the entrance of Dubai Marina, the Infinity reflects a status of prestige and with the sea as its background, the tower slowly rotates 90 degrees providing excellent views for all its residents without blocking the views of residents of neighboring buildings.